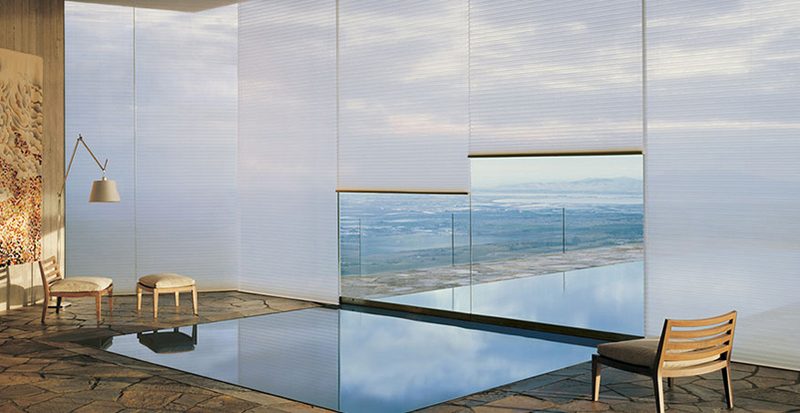 Houston Blinds For Less is proud to serve as your Hunter Douglas Houston area AuthorizedPriority Dealer. 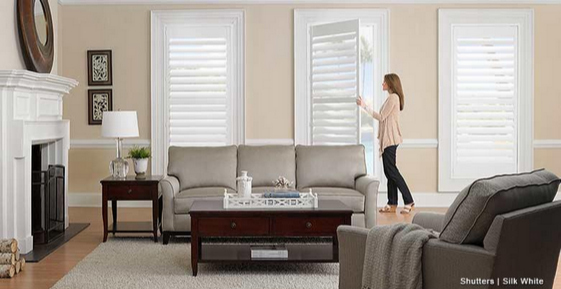 We offer a full line of the finest window covering products, so whether you areshopping for Hunter Douglas blinds, shades, shutters or shadings, Houston Blinds For Less isthe place to buy them. Explore featured products and contact us for more information. Recognized for style, functionality and a high level of energy efficiency, Hunter Douglas shades provide a quality window covering for any home or office. Choose from a wide selection of Roman Shades, Roller Shades and Honeycomb Shades by Hunter Douglas at Houston Blinds For Less. As with other Hunter Douglas products purchased, you receive a limited lifetime guarantee. 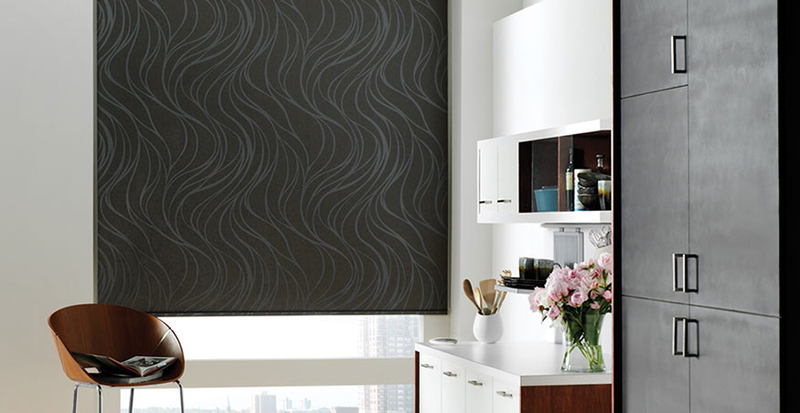 Add a bold new look to your home or office with Hunter Douglas’ Designer Roller Shades. Offering the ease and simplicity that makes roller shades so popular, the Designer Roller Shades are available in hundreds of fabric options, from sheers to opaques and floral patterns to solid colors. Designer fabric roller shades also provide protection for your furniture, flooring and valuable art by blocking at least 75% of harmful UV rays. The Hunter Douglas Applause honeycomb shades are the only honeycomb shades with triple- cell construction that provides even greater energy efficiency than the single and double honeycomb shades, which are highly energy efficient. Select from a wide variety of colors and fabrics, including the Venue™ fabrics – the first cell fabric featuring the MicroShield™ antimicrobial protection that resists bacteria, mold and mildew growth. You can also choose among various operating systems, including the vertical operating system, Vertiglide™. Control your motorized shades using an app and your mobile device. Seamlessly integrate with your home automation system. The options and possibilities seem limitless. Hunter Douglas’ original single and double honeycomb Duette® shades, available in multiple cell sizes, provide a barrier of air between your room and the outdoors so you stay cooler in the summer and warmer in winter. 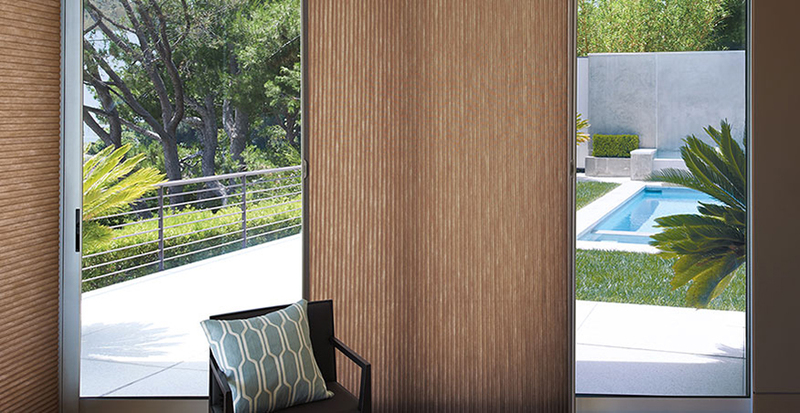 In addition to their energy efficiency and stylish beauty, Duette honeycomb shades help reduce outside noise, cut incoming glare and increase your privacy. These shades are available in horizontal or the Vertiglide™ vertical operation, with a variety of light control options, from sheer to opaque. Give your windows a sophisticated look with the Vignette® Modern Roman Shades. Select from different fold styles for a soft, modern look or one more crisp and sophisticated. Featuring consistent folds and no exposed rear cords, these modern Roman shades keep windows uncluttered and attractive. 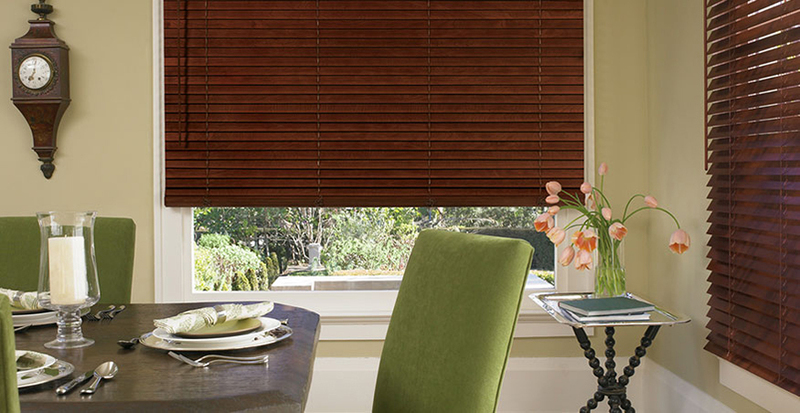 The Vignette Shades are available in various sizes with horizontal or vertical orientation. Opt for motorized shades for seamless integration with your home automation system or choose one of the other available operating systems. 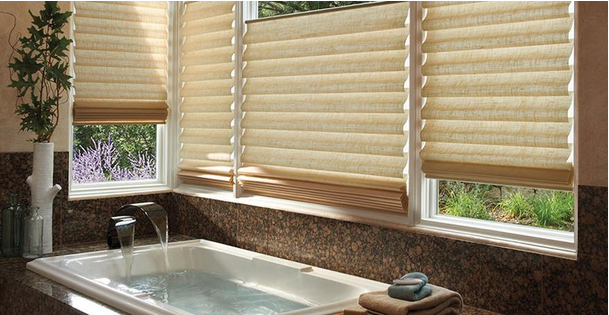 Provenance® Woven Wood Shades by Hunter Douglas add a traditional, yet modern look to your windows. 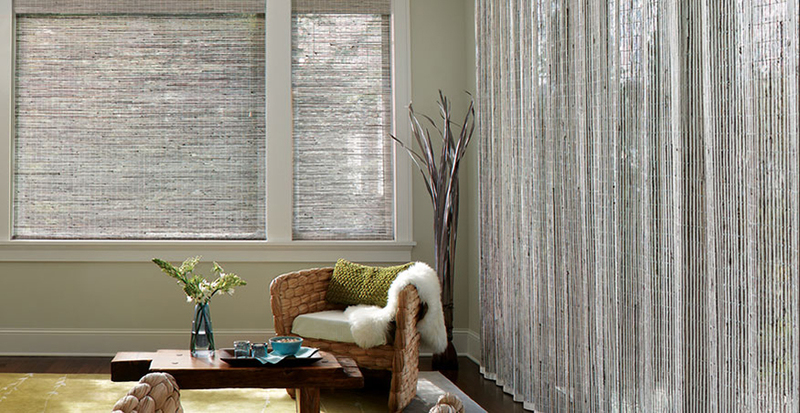 The quality shades are hand-woven from versatile, light-filtering grasses, reeds and woods that create a relaxing, spa-like ambience in a room. Their strong, durable materials minimize breaking, stretching, bowing, and fading. These woven wood shades are available in various styles, shapes and design options. Choose the vertical option for large windows or sliding glass doors. For privacy with a view, select the Top Down-Bottom Up feature. Hunter Douglas’ NewStyle Shutters offer the timeless beauty of real wood plantation shutters and the durability of modern man-made materials at an affordable cost. These hybrid shutters with wood grain-like finish will look stunning in your home or office. They provide an exceptional 99% protection from UV Rays and their micro-smooth satin finish makes cleaning the shades easy. Select from a variety of colors and operating systems. 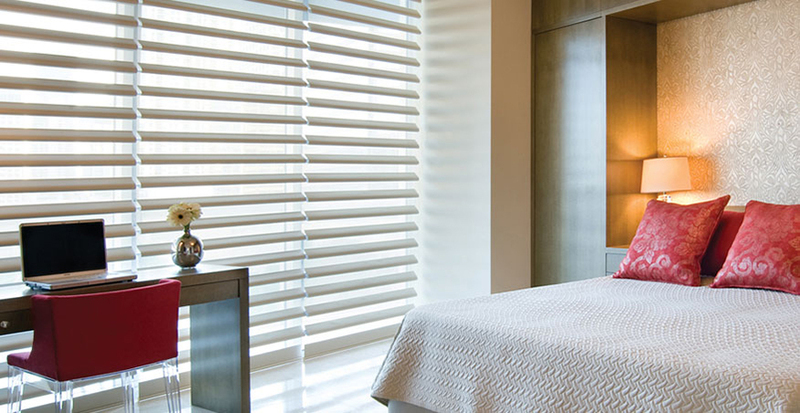 Among featured options for Hunter Douglas blinds at Houston Blinds For Less is the Parkland™ Genuine Woods blinds. Bring the beauty of nature indoors with these attractive blinds precision crafted from the finest North American hardwoods, including genuine oak and cherry wood, harvested from responsibly managed forests. The hardwoods display beautiful natural grain and color variations and will complement any décor. Select from various operating systems such as the PowerTilt™ system with the ease of motorization or the LiteRise® cordless system. 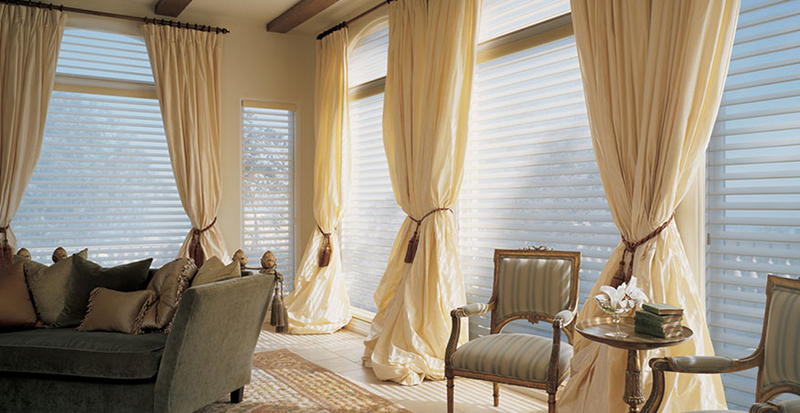 For a soft window treatment, consider Hunter Douglas window shadings. Two featured shadings recommended include the Pirouette ® and Silhouette® shadings. The versatile and elegant Hunter Douglas Pirouette window shadings enable you to control light in a whole new way. Featuring soft horizontal fabric vanes attached to a single sheer backing, the elegantly designed shadings allow for optimal light levels with dramatic effects and unmatched functionality. Closed, they look like a contemporary shade. When open, you can view through the sheer fabric with a discreet level of privacy as natural filtered light softly spreads through your room. You control how much light you want to let in. The Pirouette shadings are available in various fabrics, colors and operation options. Hunter Douglas’ Silhouette Shadings with the Signature S-Vane™ diffuse harsh incoming light and create a stunning effect as filtered light gently flows into the room. By tilting the vanes, you control your preferred level of privacy and light, enabling you to easily maximize use of natural light. For a more room darkening effect, Hunter Douglas combines the Silhouette Shading with a room darkening roller shade in a single headrail. Two shades in one, this option is called the Silhouette A Deux. Silhouette window shadings are available in various colors and vane sizes with various options for operation. If you would like to schedule a free consultation to discuss your virtually endless options for shades, shutters, shading and blinds by Hunter Douglas, Houston Blinds For Less will come to your home or office, or you can drop by our showroom between 8:00 am and 5:00 pm Monday through Friday. We serve contractors with commercial window covering projects as well as homeowners and other individual customers. Contact us for information.